The American college basketball bracket has been set and, to add to the excitement of March Madness, Intertops Sportsbook is running several free contests. The popular US-friendly online sportsbook will award $25,000 in its annual College Hoops March Madness Bracket contest and is giving away more cash and prizes in other free contests this month. Basketball fans have until Thursday to make their selections and enter the free contest. If no player manages to select a “perfect bracket”, the prize money will be divided equally amongst the 25 players with the most correct picks. 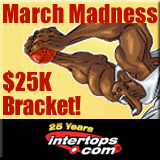 Until Friday, Intertops’ March Madness Deposit Bonus will add 20% (up to $100) to all deposits. And that’s not all: Intertops customers wagering at least $500 on the games of the March Madness tournament are automatically entered in a random draw for a $5000 cash prize -- with no rollover requirements. Also, every dollar wagered on March Madness games at Intertops is one entry in a free draw for a 2012 Final Four Weekend prize package. Intertops, which recently celebrated the fifteenth anniversary of the day it took the very first online sports bet, welcomes players from around the world and offers more wagers on more American major league sports than any other online sportsbook. It is known for quick, hassle-free deposits and withdrawals and excellence in customer service.